We sing at restaurants and coffee houses throughout Seattle about once a month. We also enjoy performing at private parties and folk festivals. Add your name to our mailing list to be informed of when and where we will sing. 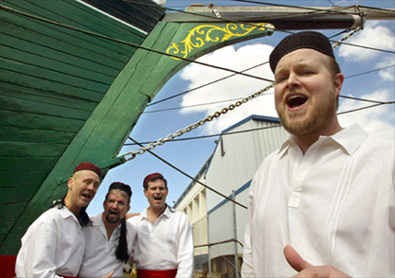 We sing at the Northwest Folklife Festival each May, the largest event of its kind in the world. We enjoy doing "sing outs" on street corners, at auction events, in churches, and for private parties. Contact us to book KlapaDooWopella for your next event. We've toured Italy and Croatia several times. We enjoyed singing with many klapas (groups of singing men) throughout Croatia including: Omish, Tugari, the Isle of Rab, the Island of Mali Losinj, and the Isle of Vis. We shared songs and learned songs and thoroughly enjoyed the wonderful people of Croatia as they hosted our visits as if we were royalty. We also enjoyed our time in Italy, where we performed at Citta' di Castello, Sansepolcro (for opening of the Palio festival), Ancona, Venice, Bolzano, various Hill Towns and in the Alpine lodges of the Schlerngebiet. Other venues we've enjoyed singing include the Alaska Folk Festival, the Yakima Folk Festival, the World Beat Festival in Salem, Little Italy in San Diego, the Coronado Hotel, Cyril and Methodius Day celebrations, the Sleeping Lady in Leavenworth, the Wurst Festival, Harmony Sweepstakes, Seattle Pacific University, Seattle University and The Acappella Summit in San Rafael. Please contact us to book KlapaDooWopella for your next event.